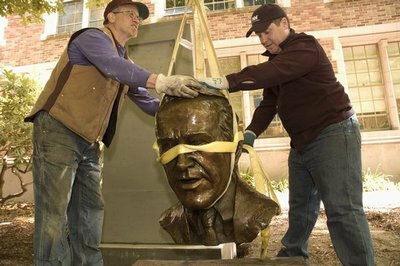 Campus Art Administrator Kurt Kiefer, right, gets some help installing the Henry Jackson bust from Ron Klein, an independent contractor who specializes in the fabrication and patinas of bronze sculpture. The bust as it looks after installation. 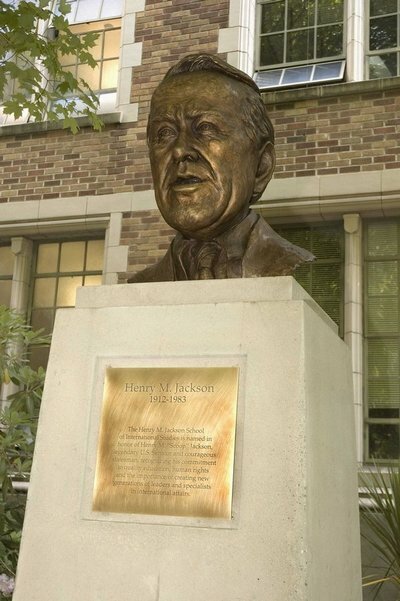 A bust of the late Senator Henry “Scoop” Jackson was moved outdoors this week, where it will greet visitors to Thomson Hall, the home of the Senator’s namesake Jackson School of International Studies. The cast bronze bust by Wendy Ross, which was a gift to the UW from the Jackson Foundation in 1984 — a year after the senator’s death — had been inside Thomson Hall since then. Most recently, it occupied a pedestal at the top of the stairs outside Jackson School Director Anand Yang’s office. The Jackson Foundation had always intended an outdoor home for the bust, said Campus Art Administrator Kurt Kiefer, but the University has historically been conservative about the placement of commemorative art. However, a renewed push recently brought approval of the move. “I think Scoop’s family and some members of the Jackson School have always felt that we needed to prominently display his association with and attachment to the school and that one way to do it — since this is Thomson hall, not Jackson Hall — is to have his bust grace the front of the building,” Yang said. The bust has been placed between the two entrances to Thomson Hall that are opposite Grieg Garden. “It will be dueling Norwegians,” Yang joked, referring to Jackson’s Norwegian heritage and the fact that composer Edvard Grieg — whose bust is in Grieg Garden — was also Norwegian. The pedestal design for the bust is, in fact, a match to Grieg’s, Kiefer said, scaled smaller because the bust itself is smaller. Prior to moving the sculpture, Kiefer had the base reinforced to help it withstand any rougher handling it gets outside. And like other bronze campus sculptures, it received a wax coating to protect the color. The Jackson school plans a “modest ceremony” at 3 p.m. on Monday, June 5, to celebrate the bust’s new placement. Members of the Jackson family are expected to attend. The Jackson School has existed in some form at the University since 1909. It was founded as the Department of Oriental Subjects — a quaint name, Yang admits. “But it means that almost 100 years ago, someone here at the University of Washington already realized that it was important given our location to be connected to the wider world, particularly Asia,” Yang said. The department went through several incarnations before becoming the School of International Studies. At the suggestion of then-director Kenneth Pyle, It was renamed the Jackson school a month after the senator’s death in 1983. The name is fitting, Yang said, given Jackson’s strong interest in international relations. Just days before his death, the senator was visiting China with Pyle. He had also been active in raising funds for the school for several years before that. The foundation helped the school with the costs of having the bust moved, and Iglitzin said she is excited about it.